Great things never happen in your comfort zone. The scariest things are often most worth doing. So I take risks sometimes. Always a calculated risk, but there’s that chance something might go wrong. This time something almost went very wrong and I didn’t even think I was taking a risk. It was one of my biggest dreams to visit the Okavango Delta in Botswana. I’d seen it in several nature series and the most recent Planet Earth II series also featured the biggest inland Delta in the world. The streams and canals are surrounded by reeds and papyrus, covering an area as big as Switzerland. The Delta are home to all sorts of animals, hippos, crocs and over 400 bird species. It’s an intriguing place that attracts people from all over the world. One of the best ways to explore the Delta is by mokoro. This is a sort of traditional canoe. A local poler will navigate the mokoro through the canals, while also watching out for hippos and crocs. Call me naive, but somehow this only excited me and I wasn’t really aware of any danger. They do this trip daily and I didn’t think a tour company would put a dangerous activity in its itinerary. We visited in March, rain season, which means water levels are high. The poler explained to us that usually hippos stay in specific pools in the Delta where it is deep enough for them. Now the water lever had risen so much the hippos spread throughout the entire Delta. Also into the smaller channels. It was not until he was pushing our mokoro through a very narrow canal that I realized a hippo encounter would be very dangerous. There was nowhere we could possibly flee to. I asked our guide if hippos ever attacked or flipped the boat. He laughed at my question and said that it did happen at times. ‘ But don’t worry, you can recognize them by the bubbles in the water’. A little more aware of movement in the water we continued our trip. As you can see in the picture there’s a lot of reeds and plants which makes it a lot more difficult to spot anything. Still I felt calm and relaxed being on the water. That was until I suddenly heard an enormous roar behind me. I turned around I saw the teeth of a hippo coming towards us. Its huge mouth snapped toward our mokoro and missed it by 1cm (not exaggerating). It wasn’t until I saw the face of the poler that the severity of the situation dawned on me. Fear was written all over his face. Our Mokoro was swaying heavily and I was getting ready to swim. I knew my chances of survival would be slim once I was in the water. What happened next is all a blur. Our poler somehow managed to balance the mokoro and push us into the reeds. By some miracle the hippo chose to leave us alone after that. We moved forward while me and my friend were still shaking. We still had half an hour to go in the mokoro and when the initial shock had worn we had fits of laughter. When you know the hippo is responsible for more human fatalities in Africa than any other large animal, you don’t take an attack by one lightly. People that hear the story afterwards call me crazy for even getting in a canoe in hippo infested waters. Maybe I am a little crazy, but I never regretted going on the trip. Sometimes you have to decide something is worth the risk. Otherwise you’ll end up doing nothing at all. I hope I live a very long life, but if I die doing something a little crazy at least I lived my life to the fullest. It’s always a risk getting up and close up to wild animals. As long as you respect the advice from experts, about safe distances, 99% of the time you’ll right. I’m very happy to hear you are ok, but you got a cracking story. OMG. This reminds me of a close shave we had with a wild elephant. Our guide had a sickle in handle and thats about it. Wilderness has its share of risks involved. But this was quite an experience. Thanks for sharing! Thats is so cool! I would love to see hippo and I would take the same risk! So worth it ! Botswana looks amazing! Great photos ! Woah! that’s pretty risky tho! LOL! I wonder how I would react to the situation in real! well, I would never do or go to this place! haha! it’s a scary exp! but you managed it very nicely! Awesome! Hi, I would like to subscribe for this website to obtain newest updates, thus where can i do it please help out. Hi there, Glad you like the website. You can subscribe to the mailing list on the blog page. There is a signup form in the sidebar. Hope this helps! Unfortunately we spent 4 weeks in a Johannesburg hospital recovering from a hippo attack in the delta last year, in circumstances arising from something very similar to those you describe. Given the number of local people who, having no choice, live by the rivers and often die in hippo attacks, I would strongly advise anyone not to get into a mokoro. It looks beautiful, and is sold as a traditional activity, but there are much safer ways of viewing the exceptional wildlife in the delta. We are both ok now, and it could have been much worse, although my wife will have a permanent disability. It has certainly made us look at “risk taking” in a new light, although we don’t want this experience to stop us from travelling. On a lighter note, your blog is very informative – keep up the good work! Wow, What a crazy story! So sorry to hear about your experience and thank you for sharing it. Happy to hear you are (relatively) ok now, I can’t imagine recovering from such an attack. I think it should be made more clear in advance what kind of risk is involved. I had no clue attacks happens that often and I think a lot of people would reconsider doing this if they knew. 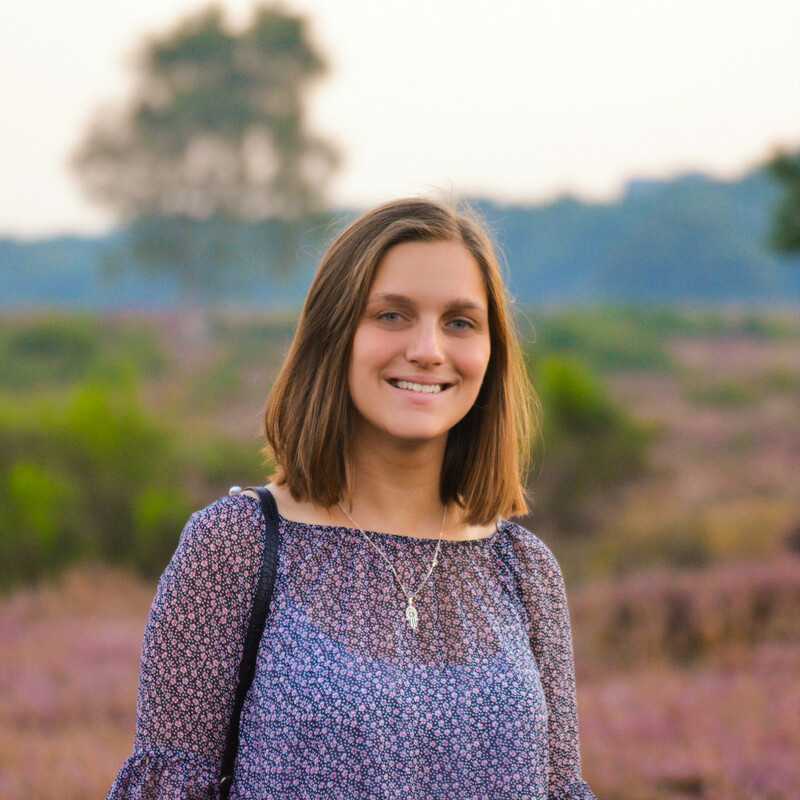 Do you mind if I share your story on my social media channels? Your story might help others make a more informed decision. Anyway, thanks very much for reading and for the compliment! I wish you all the best for your future travels, may there be only good experiences! Hi Romy – no problem to share, although we don’t want to provide any more detail regarding specific locations, dates, camps, etc. 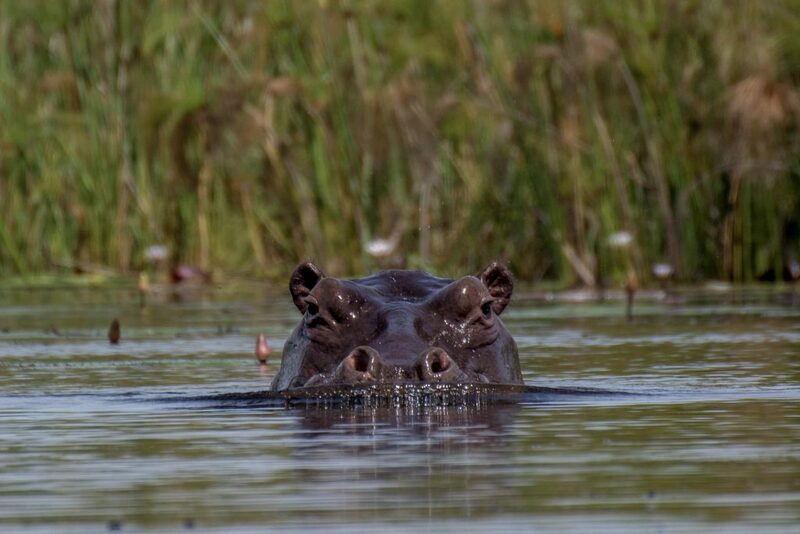 Since the accident we are obviously now “experts” in hippo attacks in Southern Africa and they are a lot more common than publicised, although you generally only hear about them when tourists are involved. We even discovered that one of our friends had witnessed a hippo attack on a canoe on the Zambesi a couple of decades ago that resulted in a fatality (unfortunately hippo attacks are usually fatal). As you mention, the guides don’t carry any protection, so there was nothing our guide could do once the hippo was upon us other than stick the pole in its mouth. “Our” hippo was unusual (?) in that he charged at us from out of the water over quite a long distance, and followed the mokoro on to the bank where our guide had rapidly steered us to try and get out of the way. Normally they only attack if you surprise them (such as sailing over them in a mokoro which you may have done) or if they are out of the water feeding and you get between them and the water. They also usually back down once they have made their presence felt. There had been some bush fires in the area the night before our accident, so perhaps this had spooked our hippo. Or, he may have recently been kicked out of his pod and was highly stressed – who knows. Certainly it took our guide by surprise, and our camp had never reported a similar incident on that specific stretch of water (hence the reason they used it for mokoro trips). However, in an area where animals are free to roam (as they should be), anything can be possible as we unfortunately proved that day. I guess our message to others would be just to think about the risks a little more as you are very vulnerable in the mokoro. Having said that I imagine we ourselves would have made the same decision as you never think it will happen to you, do you? At the very least it would be worth asking the camp for specific info on the number of hippo attacks known to have occurred in the area (both in local villages as well as camps), so you can make an informed decision when deciding to take the mokoro trip. 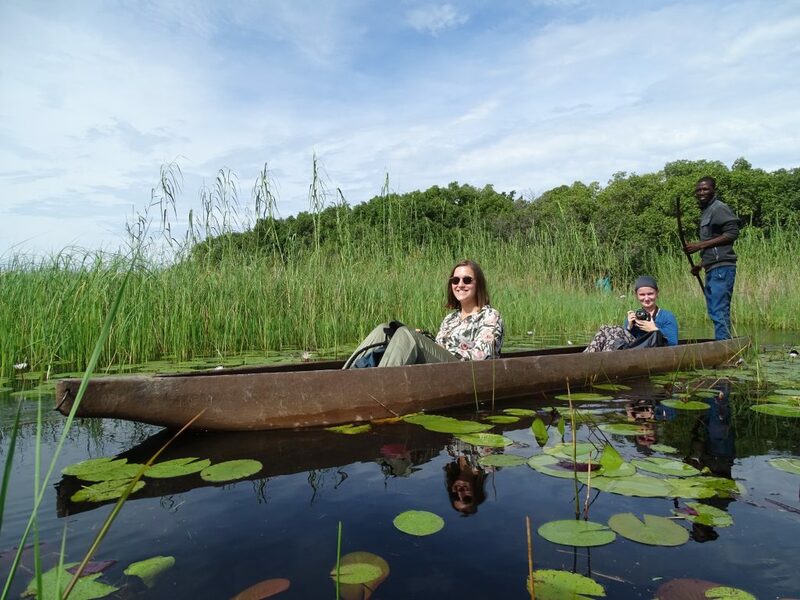 Despite all the above, we loved the Okavango Delta and all the amazing animal sightings we had before the accident. We would definitely visit again, but would stick to the relative safety of the safari jeep! The people of Botswana were also amazing, especially in our time of need, and we can never thank them enough for all their help and care. Out of interest, would you get back into a mokoro following your own close encounter? Thank you for your elaborate answer. I don’t think it’s necessary to name any camps or locations. As you said, it would be great if people are more aware of the risk they are taking when getting into a mokoro. Sounds like you were extremely unlucky as that is not their usual behavior. But in the end it is their area and we can never really know how they will react to us being there. I shared the story in my insta stories and asked my followers if they would do the trip. Almost 70% would not get into a mokoro after hearing the story while on the trip I don’t think anyone even questioned going. I think I myself would consider going back into a mokoro, but maybe under different circumstances. Honestly, I’m not completely sure. If I ever end up back in Botswana I may look further into fatalities and aks the camp for more info. The people and nature are unmatched so I can definitely see myself going back.